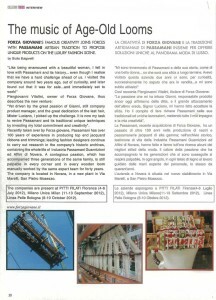 newspaper article appeared in “Novara Oggi” 26 oct. 2012. 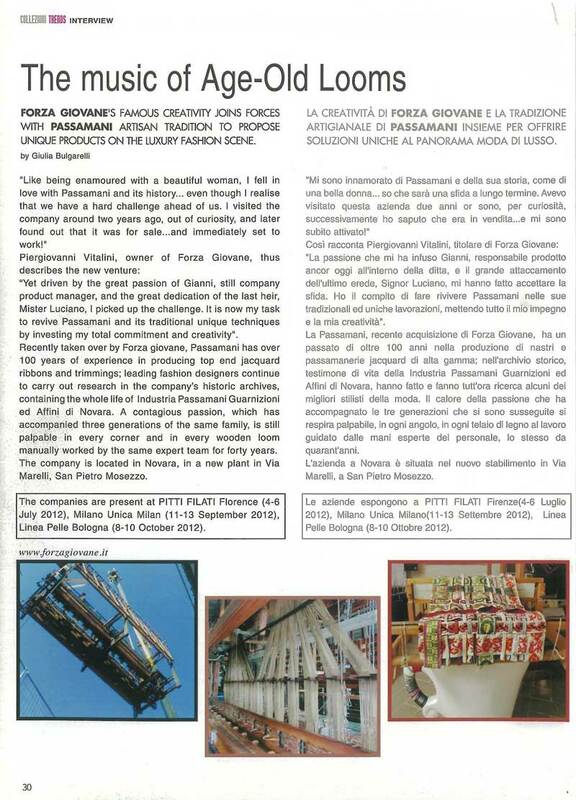 Keep alive traditions and produce high quality trims: this is the challenge undertaken by mr. Piergiovanni Vitalini that in the end of May 2012 owned “Passamani srl” and saved it, allowing it to continue the works with the use of traditional machines from 1800. “Passamani”, located in Novara, is an industry born in 1896 that was involved in the realization of furniture’s trims, tassels, jacquards..
After a long period of activity, during the month of May in 2012, this incredible industry was near the closure but, thanks to Piergiovanni Vitalini, it has been saved and transferred to San Pietro Mosezzo. If you look at the production department it seems to be in the past because you can see a lot of machines that have been constructed in the last century. “I’m from a little country near Pesaro Urbino and there I’m the owner of a company called Forza Giovane that works in the field of decorations for the high fashion. Between Forza Giovane and Passamani it has been possible to create an incredible union. Passamani could be defined as a museum because you can find ancient machines that have longer times for the production but can work every kind of yarn. Precious collaborator and friend is Gianni Vestali, responsible of “Passamani”: “I’ve worked in Passamani for the length of 38 years and I was nearly to a desperate cry when I knew that it was closing. For me this is not only a work but it is a real passion. Initially Passamani had 250 workers, then we had been forced to reduce the personal to 40 and now to 5. In this moment I’m really happy because we can continue to work with our passion and even if our machines haven’t an high economic valor, they’re an incredible piece of history and tradition (we still use a vertical warping machine and nowadays they’re all horizontal). So, the history of Passamani will continue, working with the most important international and national fashion marks.